Space is still available this Saturday (June 29) for members of the public who want to experience a unique opportunity to view bighorn sheep in their natural environment while touring Canyon Lake, about 45 miles east of Phoenix. 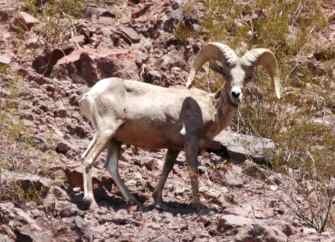 The Arizona Game and Fish Department, in cooperation with the Dolly Steamboat and the Arizona Desert Bighorn Sheep Society, will conduct a Canyon Lake boat tour to see and learn about desert bighorn sheep, one of Arizona's most fascinating large mammals. 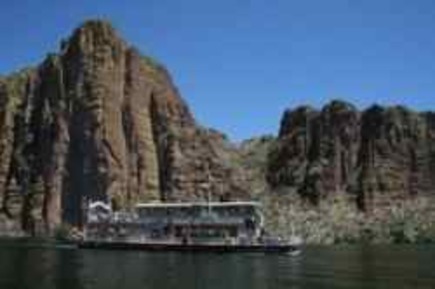 The tour on the Dolly Steamboat, accompanied by Game and Fish biologists and members of the Arizona Desert Bighorn Sheep Society, begins at 7 a.m. and lasts about three hours. Space is limited to 139 people, the number of passengers the Dolly can hold. The cost for the boat tour is $35 per person. Pre-registration is requested. To register, call the Dolly Steamboat at (480) 827-9144. "June and July are the times of year when bighorns stay pretty close to water," said John Dickson, wildlife manager in the Canyon Lake district. "The mating season is underway and the hotter it is, the better the opportunity to see the sheep along the water's edge." Participants on the boat tour are encouraged to bring a camera, hat, sunglasses, sunscreen and binoculars. Snacks and drinks will be provided compliments of the Arizona Desert Bighorn Sheep Society. "It will be hot on the lake," Dickson advised, "but that's when bighorn come down for a drink. Much of the boat is air-conditioned, but the outside temperatures will still be plenty warm, so dress comfortably and appropriately for the weather." There is also a free Friday evening (June 28) classroom session from 7-9 p.m. at the Game and Fish Mesa office located at 7200 E. University Drive. Participants will learn about bighorn sheep, their natural history, management and historical significance from biologist Bruce Sitko, a long-time student of bighorns. Space for the Friday evening classroom session is limited to 70 people due to facility restrictions. People who will be doing the Saturday boat tour are encouraged to attend the classroom session to make the viewing tour more meaningful. 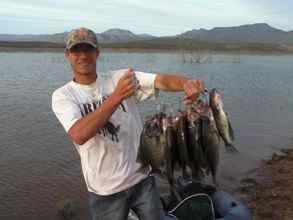 To reserve your space for the classroom session, please call Randy Babb at the Game and Fish Mesa office at (480) 324-3546. Additional questions should be directed to Randy Babb at (480) 324-3546 or e-mail at rbabb@azgfd.gov.